COMPARIN’ CONTRAST: Stars have aligned, and two of the more enticing names in jazz are passing through Santa Barbara in the next week. Go figure. Superficially, they might seem to veer toward opposite poles of the jazz style spectrum. Tierney Sutton, making her third annual return visit to the Lobero on Saturday, is among the most heralded so-called “mainstream” jazz vocalists of late, although she’s been honing her craft since the early ’90s. The Bad Plus, booked at SOhO for a CD release party next Wednesday, is the acclaimed avant-jazz-pop-oddball “acoustic trio with the electric attitude” that has built a sizable audience for its improbable aesthetic blend of Ornette Coleman, Ahmad Jamal, Queen, Black Sabbath, and other idiosyncratic ingredients. These seemingly disparate artists do share certain traits. Both have bravely forged their way onto the scene in recent years, during which time jazz has grown more fickle and treacherous for newcomers. Both have also recently released albums as strong as any in their catalogues to date-Sutton’s On the Other Side (Telarc) and The Bad Plus’s stubbily titled and big-idea-wielding Prog (Do the Math/Heads Up). The S.B. 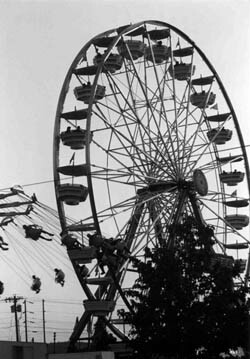 Fair & Expo offered adventures on the Ferris Wheel and in the musical arena. Sutton has a deep, almost uncanny connection with the Lobero. The Bad Plus put on an amazing show there late in 2005, and while the crowd was modest, all present appeared to be aware of something magical in the house. Both of these shows promise to be of the must-see-if-possible variety for discerning jazz lovers with open minds and hearts. FAIR NOTES, SMELLS: It may not officially belong to the grand and funky tradition of the American County Fair (the official S.B. County Fair happens in Santa Maria come summertime), but the Fair & Expo, in its 18th annual landing last weekend at Earl Warren Showgrounds, is ours, and we love it. Where else can you bask in the aroma of livestock within city limits or see jumbo-horned Watusi cattle? This year’s Wild West theme seemed redundant, but then one had to wonder where the (country &) western music was at. We did hear some earnest singer/songwriters and a surprisingly decent early Genesis tribute band called Gabble Ratchet, with the required blend of musical chops and nerdy fetishism to do the job correctly. But the F&E’s musical high point took place in the arena on Sunday evening, where ranchera star Pepe Aguilar-who played the Santa Barbara Bowl recently-headlined a long variety show. Warming up the crowd, a mini-rodeo featured a live band for the horseplay, bull-riding, and rope-twirling. In the band were saxes, trumpets, and two drummers, including timbales and cymbal, which were used to highlight the dramatic moment when a bucked rider struck the dirt. A hopeful rider perched over el toro while the brass band pumped away. He genuflected and hopped on the wily beast as the gate burst open and all kinds of convulsive, adrenaline-fueled hell broke loose. That’s entertainment! Further entertainment came in the form of crooner Aguilar, whose sharp mariachi band played onstage while the singer did his business on a sideways-walking horse. Aguilar sang his heart out and sweetly bonded with the audience, even swigging beer from their plastic cups. All’s fair at the Fair.